Having spent the last 25 years working in retail and fashion, my wife Cristina and I could clearly see a strong need for High Street fashion retailers to dramatically improve customer service by providing tailored advice to women and men on how to dress to complement their body shape. To help people look and feel great in what they’ve purchased. For want of a better phrase, to start “dressing without guessing”! Surely, if you can provide a service that gives people clothes and accessories they will always look great wearing then this is a ‘win win’ for both the customer and retailer. Find out how SETsquared’s Entrepreneurship Programme could give your high tech business a real boost. That’s when HOLM was born. It starts as an in-store service. A sales assistant takes a customer’s measurements and runs through a short interview that takes a matter of minutes. Then, using a tablet or smartphone, the customer’s data is stored on our app, creating their profile. The magic follows where our cloud hosted software automatically ranks the retailer’s clothing, by garment type and the results are then shown to the customer. No browsing or wasting time shopping. Just straight to selecting items that we already know will look great on them. 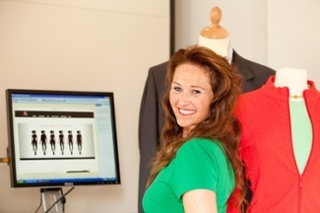 Turning sales assistants into highly skilled stylists, just without any of the training necessary! Turning ‘changing rooms’ into ‘choosing rooms’! Thereafter, it’s even more convenient as the customer’s profile can be used for future store visits or when shopping online. We’ve even designed it so retailers can use our software to send highly personalised email and direct mail. The kind that’s totally bespoke to you as an individual. The kind you will want to open above anything else! The service has already been trialed within several major fashion retailers. Increasing in-store turnover by 150% in a HOBBS store and reducing online returns by a staggering 70% versus Kettlewell’s company average. And that’s where SETsquared’s Entrepreneurship Programme really gave us the validation we hoped. A confidence boost to take our plans to the next stage. Plus valuable guidance to re-evaluate our value proposition and elevator pitch, so that it had more impact in front of retailers and clearly articulates the benefits of deploying HOLM’s software. This included spending time looking at people’s purchasing decisions and how these are made on both logical and emotional levels. Our software is essentially helping people feel confident in the clothes they wear, which is definitely tapping into emotions. This needed to be more clearly and carefully reflected in our sales messaging. We got a lot of value out of SETsquared’s Entrepreneurship programme. The sessions are broken down into bitesize chunks, making it really easy to digest and understand. It was good to hear we were already doing a lot of what was recommended. With plenty of other top tips we could quickly implement. It was also incredibly inspiring to listen to experienced entrepreneurs share insights into their successes and failures. Cristina has invested more than 10,000 hours of consumer / market research into this business concept, so to get such positive feedback from the dozen or so mentors who attended our SETsquared’s Entrepreneurship Programme, really re-affirmed what we are doing is creating a much needed service. I would urge anyone thinking of starting a tech-based business to go on this course, as it will set you on track to develop a viable business. We will now be taking HOLM forward with the guidance of the team at SETsquared Basingstoke and using their expertise to get us to the stage where we can attract investment. Advice that helps us avoid common mistakes and scale efficiently is a similarly attractive and welcomed bonus!